This Thursday, Sept. 29 is National Coffee Day, and let’s face it, we all love coffee. To celebrate this foodie holiday, try a healthy alternative to coffee that is rivaling our love for traditional espresso: Teaspressa. Teaspressa will be serving an exclusive National Coffee Day beverage at its cafe in Old Town, a Salted Caramel Tea Mocha. Teaspressa is also giving a complimentary set of its gourmet salted carmel sugar cubes with any purchase of a Teaspressa product. Complimentary sugar cubes are eligible for both online shoppers and in-person shoppers on Thursday Sept 29 only. Teaspressa products can be purchased on its website at www.teaspressa.com. Teaspressa is “coffee 2.0:” it contains just as much caffeine as an espresso shot, but provides you with the health benefits of traditional tea…and without the common side effects caused by coffee that we all love to hate (headaches, jitters, tummy aches etc). Teaspressa was launched by Valley entrepreneur, Allison DeVane, using a patented Tea Concentration Technology she developed that uses loose leaf tea to produce “tea shots” that are brewed like espresso shots and create full-body tea drinks that are comparable to popular coffee drinks. 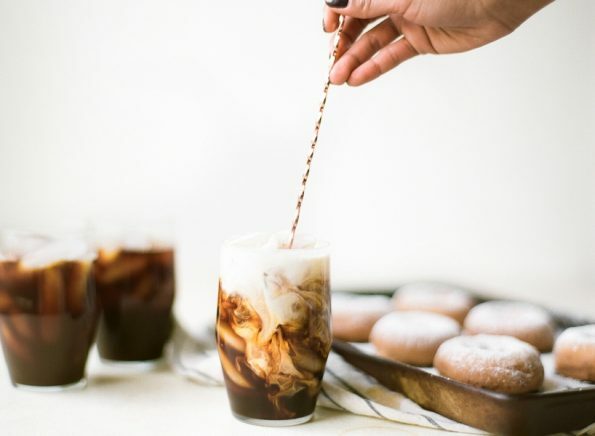 Just like espresso, Teaspressa is mixed with milk to create lattes and other gourmet coffee-like beverages, including Pumpkin Spice Lattes, Carmel Macchiatos, and Americanos. Teaspressa is a pioneer in gourmet tea preparation, handcrafting the first and only hybrid beverage that combines the best of both the coffee and tea worlds. Teaspressa’s Signature Tea Blends are created using a patented Tea Concentration Technology developed by Teaspressa’s founder, Allison DeVane. Teaspressa’s Signature Tea Blends are loose leaf and prepared like espresso shots, resulting in gourmet Tea Lattes and coffee-inspired beverages that contain as much caffeine as espresso, but provide consumers the health benefits of traditional tea. With its high caffeine levels and positive health benefits, Teaspressa is the leading alternative to traditional coffee and tea beverages. Teaspressa was featured on Shark Tank in 2016 and selected as a member of Tory Burch Foundation’s Business Fellow Program. Teaspressa is sold online throughout the U.S. and at its café in Scottsdale, Ariz. To shop Teaspressa products, or to learn more, please visit www.teaspressa.com.